Screencap via Pokémon Go; Annotation by the author. This weekend, I walked around Central Park—a hub for Pokémon Go enthusiasts, apparently—for about three hours trying to catch some good pocket monsters. All I got was a flock of Pidgeys. I hate them. Pokémon Go purportedly offers users the chance to get out in the real world and become Pokémon masters. Theoretically, if you put the time in, catch enough Pokémon, and evolve them, you can claim gyms for your team and accrue the best collection around. The problem is, most Pokémon that I’ve encountered are bad and dumb. At the inception of this blog, I was the proud owner of 17 Pidgeys, 11 Rattatas, and a small herd of Zubats and Weedles. I managed to evolve one of the Weedles, but as you know, that only makes it turn into Kakuna, who is a boring yellow bug with eyes. My coolest monster is Pinsir, but everyone has Pinsir. (I was thrilled to catch one, until I saw five more before I left the park.) 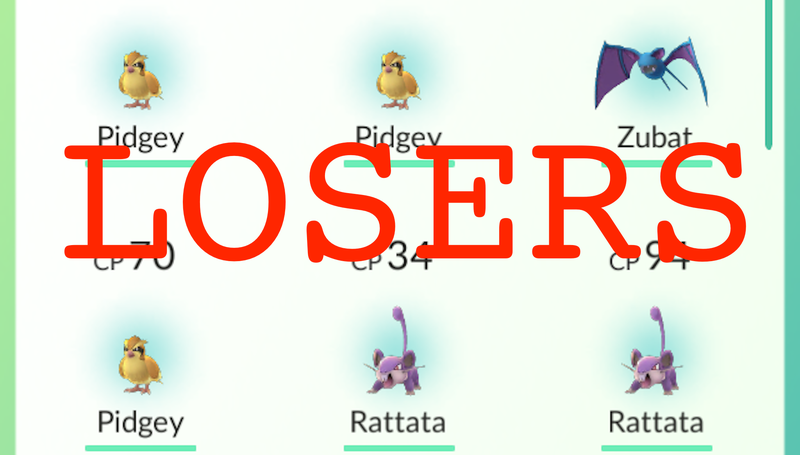 When I tried to take over a gym, Pinsir lost to a goddamn Nidoran♂, another trash Pokémon. Pinsir is bad. Was I destined to end up one of those anonymous junior trainers who just sit around Viridian Forest, waiting to get owned by every passerby? Were the powers that be simply using my personal information to laugh at me for failing to catch any good Pokémon? I asked Kotaku senior writer Patricia Hernandez if I was just a dingus or what, and she assuaged my fears. Apparently, good Pokémon only appear after you’ve reached a certain level. Catching a ton of idiot monsters is good because you can transfer them to Professor Willow, which is a nice way to say, “Murder them dead in exchange for evolutionary candy.” Turns out, the path to Zapdos is littered with the corpses of thousands of Pidgeys. So now I have a Pidgeot, which is a better Pidgey. I am the captain of this ship. The rest of my monsters are dumbass losers, but at least I have the bird with the best hairdo.